Incorporated in 1867, Marlin became a typical Texas railroad town. The Houston and Texas Central Railway line was completed in 1871, tripling the town’s population from 500 to 1,500 that decade. A second line, the International-Great Northern, was built into Marlin in 1901. What made Marlin different from other railroad town was the discovery of hot mineral water in the area in 1892. Known as the “Hot Mineral Water City,” Marlin’s economy became based on the health and tourism industries for the next 50 years. Jews would play a central role in the rise of Marlin as a spa city. As early as 1879, in his letters chronicling his travels throughout the South, Charles Wessolowsky wrote that he found about 50 Jews from eight families among Marlin’s 2,000 residents. One of these early Jewish settlers was George Frank. Born in Suwalki, Latvia, he immigrated to the United States in 1860 at the young age of 12, joining his father in New Orleans. Sometime after his arrival, he settled in Marlin, where he opened a successful grocery business. He was very active in the Marlin community, serving as a city alderman for 16 years. In addition, he was a member of some 14 different fraternal organizations in Marlin and its surrounding areas. He became a member of the Masonic Lodge at the age of 21, served as secretary of the Marlin Lodge for 28 years, and was a 33rd Degree Honorary Mason. He was also a charter member of the Marlin Knights of Pythias Lodge and a member of the Odd Fellows Lodge. He was also connected to the Jewish community in the area, joining the B’nai B’rith Lodge in nearby Waco. Another important early Jewish resident of Marlin was Marx Levy. Born in Poland in 1846, he immigrated to the United States in 1863 through New Orleans. Working as a peddler, he traveled throughout Louisiana, Arkansas and Texas before permanently settling in Marlin. After the 1871 arrival of the railroad and with $3,000 in savings, he established a mercantile business, Levy & Rosenthal, with partner M. Rosenthal. The partnership dissolved in 1880, and Levy operated the business alone until 1885, when he partnered with his brother, Mose. Called Levy & Bros, the general store sold items ranging from shirts, shoes and socks to barbed wire, farm tools, as well as sugar, flour and whiskey. The store continued until 1900, when the brothers parted ways. Mose opened his own mercantile business that same year, operating it until his death in 1913. Zionist leader Jacob de Haas, traveling through Marlin in 1904 on a two-month tour of the American South, was surprised to see signs of a Jewish community in a place like Marlin. In a letter to his wife written in Marlin, he said, “I thought I was the only Jew here, but I had not stepped out before I saw the name of Levy, then two ending in ‘ski,’ watch-makers and jewelers and a Jewish money lender – verily we are scattered.” Jewish residents of Marlin at this time include confectioner Abe Aronsohn, dry goods merchant Jacob Kroll, ice plant manager Nathan Naman, Ike Handleman, who owned Handelman Bros. and later the The Famous store, cigar stand owner L. Ginsburg, ice plant owner Ike Nathan, confectioner Solomon Silverman, dry goods merchant L. Louis and his music teacher wife Fannie, cotton merchant Samuel Samuels, and Sol Golding. All of these Jews were immigrants from Poland or Russia. With this growing number of Jews living Marlin, they began to take halting steps toward organizing a community. As early as 1898, Marlin Jews held services together for the High Holidays. Their next priority was teaching their children about Judaism, so in 1900 they organized a religious school with Solomon Silverman as its supervisor. Four years later, Marlin’s Jews created Congregation Beth El, with Silverman serving as its president. Although its members were largely immigrants from Eastern Europe, most had been in the United States for many years. Thus the congregation was Reform in practice, as they soon ordered 30 copies of the Union Prayer Book, published by the Central Conference of American Rabbis to serve Reform-practicing Jews. ​Without a building of their own, Marlin’s Jews conducted High Holiday services in various places including Maccabee Hall, the Knights of Pythias Lodge, and the Phipps building. While they never had a full-time spiritual leader, sometimes visiting rabbis would come to Marlin. A 1917 Union of American Hebrew Congregations report noted that Rabbi Isidore Warsaw of Waco visited the Marlin congregation twice a month to conduct services and oversee the religious school. 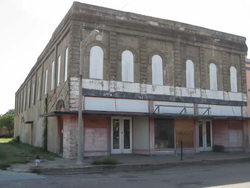 It also indicated that the Jewish community in Waco pledged to help the Marlin Jews purchase property for a building. However, soon thereafter the Marlin congregation seems to have disbanded, and no synagogue was ever built. Located just 30 miles from Waco, which had a large Jewish community with two congregations, Marlin simply couldn’t compete. Once the roads were improved between the two cities, it became easy for Marlin Jews to travel to Waco for the Jewish holidays. George Frank and Nathan Levy of Marlin both joined Temple Rodef Sholom in Waco. On Rosh Hashanah in 1922, the Marlin newspaper noted that most of the local Jewish population “will spend the day at their homes, although a number will attend services at the synagogue in Waco.” It seems clear that Congregation Beth El, which was never formally chartered, had disbanded by this time. Despite the decline of the Marlin Jewish congregation, Jews, especially the Levy family, continued to live and thrive in the town well into the 20th century. Marx Levy’s son Joe was the proprietor and manager of the Marlin Sanitarium Bath House. A two-story brick building, it provided baths from Marlin’s hot water, especially to those suffering from rheumatism, stomach troubles, and blood and skin diseases. Marx’s other son, Albert, was the owner of a popular theater and playhouse, the Electro. It presented moving pictures, illustrated songs and operas. Albert Levy, described as “the zealous and capable manager,” was commended for “securing and presenting the best moving pictures and illustrated songs ever put before the pleasure-loving public of Marlin.” In addition, he served as city secretary for some time. By the time of the Great Depression, Marlin’s heyday as a spa town was past. New medical treatments for bone ailments diminished the popularity of hot springs. With this general decline, there was a significant drop in the city’s Jewish population, as many Marlin Jews moved away looking for greater economic opportunities. In 1912, one local Jew estimated that 200 Jews lived in Marlin; by 1937, only 27 Jews remained. By the time of Nathan Levy’s death, the Jewish community of Marlin was basically defunct. Once, when economic opportunity bubbled up like the area’s spring water, Jews were drawn to the area. But with the decline in the local economy and the rise of nearby cities like Waco, Jews moved away, leaving few vestiges of their once prominent presence.